Jeff, how did the association with Chetan happen? Jeff: We have been publishing Chetan’s ebooks since 2015. It is a natural extension into print and audio and, hopefully, many other formats. And, that would not just be in India, but global as well. 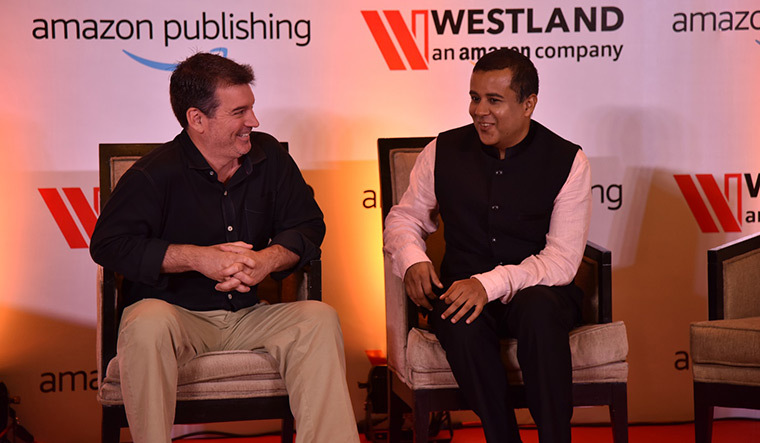 Chetan, what was so enticing about the Amazon deal for you to break off a 14-year association with Rupa Publishing? Chetan: I do not see it as ending an association. They will still be publishing all my books that have come till this moment. I will be involved with that task, too. But, I want to explore new frontiers. I need a partner who can take me global and who can make me reach every corner of India. I got that in Amazon. Your stories have all been India-based. Going global, will there be a change in approach? Chetan: [Amazon] have not told me to. They have not said that I need to write now for the Zimbabwe market, which I cannot. Good stories are universal. A lot of people pick up my books to find Indian stories. But my last book, One Indian Girl, was set in New York, so anything is possible. Jeff, do you want things to change? Jeff: I would be very happy to take books about India and to promote them to readers around the world. Chetan, in an interview after 2 States, you had said that the foreign market is not your focus. Chetan: That was 2009. At that time, I was relatively new. Today, we have an Amazon Publishing, which can give you global access. That was very difficult at that time. Nine years on, I think it is time for me to step up the game. Jeff: There are many many more readers to be reached in India—English readers and a few translations. Chetan’s creativity is not restricted to his books. He is very thoughtful about business planning and marketing distribution. We want to work with authors who are going to challenge us in those areas, and not just editorially. Chetan, you are also fascinated with the idea of the video/entertainment medium, with almost all your books being turned into movies. Chetan: I am fascinated by everything. Books are what have made me who I am. But, if I get opportunities to do digital entertainment or films, I will do it. Will the upcoming books be made into movies on Amazon Prime Video? Jeff: Let’s focus on the books and make them great. Then, everything will follow. It is too soon to tell. But down the road, let us see how it gets. People have become very ruthless on social media. Chetan: Anybody who is popular [faces criticism], especially because of Twitter, which has become very negative. If you are a writer, you will say things that not everybody will agree with. You are creating change and writing stories about a modern, progressive India. I don’t write regressive stories. Some people who are more traditional will get upset. I used to be very touchy about criticism. I did everything, spreading myself too thin—do movies, do this, do that.... And, I just went a little crazy. Then I realised books are the most important part of life. You had done a dance reality show (Nach Baliye 7) , which got you a lot of flak, because writers don’t do such things. Chetan: I was a judge on the dance show, not a participant. That changes things. The show is one of the most popular shows in the country and I got a chance to do it. Everybody found out who I am and they will pick up my book. It was a marketing [strategy]. I have no regrets.